湖泊科学 2016, Vol. 28 Issue (1): 40-49. DOI: 10.18307/2016.0105. 何延召, 柯凡, 冯慕华, 李文朝, 陈向超, 周峰, 巢湖表层沉积物中生物易降解物质成分特征与分布规律. 湖泊科学, 2016, 28(1): 40-49. DOI: 10.18307/2016.0105. HE Yanzhao, KE Fan, FENG Muhua, LI Wenchao, CHEN Xiangchao, ZHOU Feng. 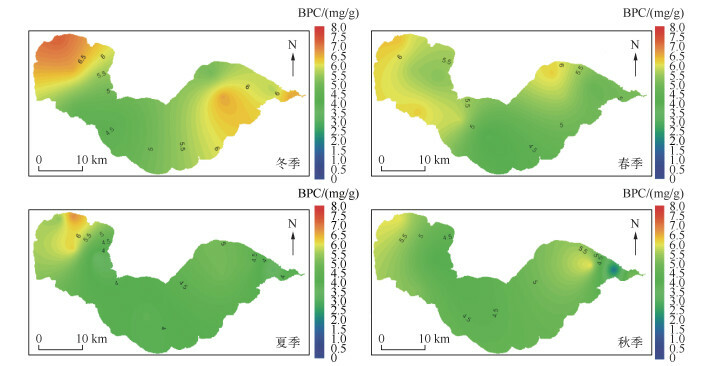 Characteristics and distribution of biodegradable compounds of surface sediments in Lake Chaohu. Journal of Lake Sciences, 2016, 28(1): 40-49. DOI: 10.18307/2016.0105. 摘要：富营养化湖泊的藻类残体大量沉降到湖底, 其中易降解成分的降解和转化快速消耗底层水体中的溶解氧, 极易造成水土界面缺氧, 影响湖泊生态系统的健康.于2014年对巢湖12个样点的表层沉积物进行周年跟踪研究, 分析样品中有机质来源、总有机碳(TOC)、蛋白质、总糖、总脂以及生物聚合物碳(BPC)等成分含量, 揭示易降解有机质的成分特征及在巢湖的分布规律.研究表明:巢湖表层沉积物TOC含量较高, 全湖样点平均含量达到1.24%.BPC含量占TOC含量的30.99%~60.48%, 有机质中易降解成分含量较高, 并且在冬季和夏季时在巢湖西北部湖区有明显累积; 有机质及其中的生物易降解部分均主要集中在粒径4~8μm的表层沉积物上, 在应用工程技术手段处理、降解表层沉积物中的过量有机质时, 更应该关注粒径为4~8μm的沉积物颗粒. Abstract: In eutrophic lakes large amount of algae detritus fall down to the lake bottoms every year. Dissolved oxygen in water would be consumed rapidly by labile compositions during degradation and transformation of the organic detritus, which can easily cause water hypoxia, affecting the health of lake ecosystem. Throughout the 4 seasons of 2014, 12 sampling sites for collected from surface sediments in Lake Chaohu were chosen to study the biodegradable organic components. In order to study characteristics of the labile components within the detritus and the distribution in the lake, source of organic matter, TOC, PRT, CHO, LPD and BPC contents in the samples were analyzed. Results have shown that the content of organic matter of surface sediments in Lake Chaohu is high, the average content reached 1.24%. BPC content accounts for 30.99% to 60.48% of TOC. The biodegradable organic components were relatively high, which accumulated obviously in northwestern Chaohu in winter and summer. The organic matter and biodegradable parts of surface sediments mainly adsorbed on the particle size of 48μm, so that the particles ranged from 48μm should be concerned when we use engineering measures to deal with excess organic matter in surface sediments. 巢湖位于安徽省中部(31°25′28″~31°43′28″N，117°16′54″~117°51′46″E)，属河成型浅水湖，是我国五大淡水湖之一.湖泊长度61.7km，平均宽度12.5 km，湖面面积756 km2，平均水深3.06 m，蓄水量20.7×108 m3.湖区属北亚热带季风气候，年均气温16.1℃.巢湖入湖水系主要有：新河、塘西河、十五里河、店埠河、柘皋河等，由裕溪河连接巢湖汇入长江.巢湖闸等水利工程的建设严重妨碍了巢湖与长江水体间的自然交换能力，使得巢湖自然换水周期过长，进而改变了巢湖的生态学特征.自1970s以来，随着工农业的发展，大量的氮、磷输入巢湖，导致湖泊富营养化，巢湖西半湖较东半湖污染更为严重[2-3].由于水质的恶化，巢湖蓝藻水华暴发频次总体呈现出上升趋势，发生区域呈扩大趋势，发生时间呈延长趋势，蓝藻密度不断升高，死亡的蓝藻沉积到湖底，形成一层高含量有机质层. 易降解有机质成分复杂，需要应用合适的方法和指标进行研究.易降解有机成分从生物化学的角度主要分为蛋白质(PRT)、总糖(CHO)、总脂(LPD)3类，其降解难易程度为：蛋白质＞总糖＞总脂.对藻细胞组分的研究发现，藻细胞主要由蛋白质、糖类和脂类物质组成，他们的相对含量因藻种类的不同而有所差异.通常蓝藻中蛋白质含量较高(41 % ~69 %)，而硅藻中脂类含量较高(5 % ~43 %)[28-30].然而这些生物化学成分并不完全由碳组成，并不能完全代表生物易降解成分的含量，而要从生物可利用碳来分析其易降解成分含量.Lopez-Fernandez等研究了地中海西北部布拉内斯峡谷沉降颗粒有机质中生物可利用化合物的含量变化，使用生物聚合物碳(BPC)指标来对易降解成分进行综合描述，取得了较好的结果.由于BPC指标能够更好地代表更容易被降解利用的有机成分的总量，并且对易降解的有机质成分在时间上的变化有较高的灵敏度，因此非常适宜用来表征有机质中的易降解成分含量[13, 18, 32-35].由于生物易降解物质是细菌和底栖小型生物的主要物质能量来源，因此对生物易降解成分分布规律的监控具有重要意义. 将新鲜样品混合均匀，用药匙从样品袋中取0.2 g左右置于100 ml烧杯中，加10 %双氧水溶液10 ml，放到电热板上加热至反应完成；然后加入10 ml 10 %的盐酸溶液，再注满水静置过夜；待样品浸泡好后，小心将上清液倒出，剩余约10 ml即可；再在样品中加入10 ml六偏磷酸钠，于超声波振荡仪中振荡15 min；振荡后的样品采用英国Malvern公司生产的Mastersizer 2000型激光粒度仪测定，测量范围为0.02~2000 μm.粒径分布参考李强等的划分方法以百分含量表示. 将适量的干燥样品放入事先称过重的离心管中，并进行称重，然后加入≥2 ml的HCl(1 :3 v/v)，震荡使其充分反应，静置18 h，用蒸馏水洗至中性后用冻干机冻干，用CHN(EURO EA 3000)元素分析仪测定TOC和总氮(TN)含量(以%表示)，并计算TOC与TN的比值(C/N). 2014年巢湖表层沉积物中TOC含量变化不大，在0.42 % ~1.81 %之间，平均为1.24 % (图 2a)，比2011年巢湖表层沉积物TOC含量(平均为5.987g/kg)高；远高于太湖沉积物TOC高值区(≥2.30g/kg)竺山湾、西部沿岸区、梅梁湾、贡湖地区(平均值为1.59g/kg)，根据天然水体“Dead Zones”形成4阶段理论-藻类有机质大量累积、偶尔出现缺氧、经常性出现缺氧、厌氧并释放H2S，巢湖沉积物中TOC含量已经满足发生黑水团的首要条件.TOC含量总体上呈现西湖区高、中湖区最低的趋势；其中最大值出现在西湖区的C-1、C-2样点，最小值出现在东湖区的C-11样点；西湖区的C-5~C-1样点呈现出逐渐增大的趋势.中、西湖区各样点4个季度TOC含量变化不大，东湖区C-10~C-12样点TOC含量在不同季节略有差异.虽然外源营养的输入以及蓝藻水华暴发造成巢湖污染比较严重，但是由于巢湖是浅水湖泊，沉积物水界面生物化学作用非常活跃，部分有机质在沉降过程或沉积后被快速降解，导致巢湖沉积物中有机质含量明显低于水质较好的深水湖泊程海(2.76 %)、青海湖(2.978 %)和抚仙湖(南部：9.232 %，中部：6.614 %，北部：2.76 %).巢湖西湖区水质处于重富营养化状态(2013年出现了叶绿素a浓度为1229.834μg/L的峰值)，蓝藻暴发频繁，大量藻类死亡后腐烂沉积，造成西湖区沉积物TOC含量相对较高.东湖区的TOC含量偏高主要与这一区域也有蓝藻水华的暴发有关(2013年东北部的叶绿素a浓度显著增加，大范围的区域均超出了163.12μg/L，并且在最东部出现了最高峰值)；同时也有可能受到巢湖闸外泄排水的影响，有大量有机质随水流流向该区域. BPC含量代表容易被生物降解利用的有机成分的总量.本研究的结果显示，巢湖表层沉积物中BPC含量占TOC含量的30.99 % ~60.48 % (表 1)，平均值为43.17 %，所占比例相对较高.一方面，虽然各样点TOC含量年变化总体相对稳定(图 2a，C-10~C-12样点除外)，但是BPC含量和组成比例变化较大，BPC的变化更能反映湖底表层沉积物生产力的变化.因此，本研究用BPC来反映巢湖生物易降解成分不仅可行，而且将其用于描述有机碎屑沉降后的早期降解过程会具有较高的灵敏度.另一方面，尽管只有一部分BPC能够被快速降解消耗[19, 64-65]，但是已经有很多研究表明沉积物中底栖动物量与BPC含量及组成密切相关[66-68]，因此，监控沉积物中的BPC含量及其在重污染湖泊中的分布有助于提前预知水体缺氧或者厌氧事件. 在大型浅水富营养化湖泊中，巢湖全湖样点表层沉积物中TOC平均含量达到了1.24 %，有机质含量较高.采用BPC指标能够较好地反映巢湖湖底表层沉积物易降解成分的含量，其占TOC的比重介于30.99 % ~60.48 %之间，平均值为43.17 %，BPC总体上呈现出西湖区含量高、中湖区含量低，冬春季节含量高、夏季含量低的时空分布特征. Yin H, Deng J, Shao S et al. 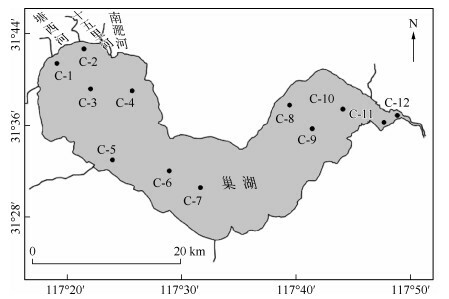 Distribution characteristics and toxicity assessment of heavy metals in the sediments of Lake Chaohu, China. Environmental Monitoring and Assessment, 2011, 179(1/2/3/4): 431-442. 孙贤斌. 巢湖生态环境污染与防治对策. 国土与自然资源研究, 2001, 3: 50-52. 刘莹. 巢湖蓝藻富营养化监测与预警优化研究[学位论文]. 合肥: 合肥工业大学, 2012. 王成林, 张咏, 张宁红等. 太湖藻源性"湖泛"形成机制的气象因素分析. 环境科学, 2011, 32(2): 401-408. Fabiano M, Danovaro R, Fraschetti S. A three-year time series of elemental and biochemical composition of organic matter in subtidal sandy sediments of the Ligurian Sea(northwestern Mediterranean). Continental Shelf Research, 1995, 15(11/12): 1453-1469. Grant J, Hargrave BT. Benthic metabolism and the quality of sediment organic carbon. Biological Oceanography, 1987, 4(3): 243-264. 李强, 霍守亮, 王晓伟等. 巢湖及其入湖河流表层沉积物营养盐和粒度的分布及其关系研究. 环境工程技术学报, 2013, 3(2): 147-155. 刘成, 邵世光, 范成新等. 巢湖重污染汇流湾区沉积物营养盐分布与释放风险. 环境科学研究, 2014, 27(11): 1258-1264. 余秀娟, 霍守亮, 昝逢宇等. 巢湖表层沉积物中重金属的分布特征及其污染评价. 环境工程学报, 2013, 7(2): 439-450. 宋慧婷, 吴振斌, 贺锋等. 武汉月湖和莲花湖表层沉积物中持久性有机物的污染状况. 长江流域资源与环境, 2008, 17(3): 431-435. Brown MR, Jeffrey SW, Volkman JK et al. Nutritional properties of microalgae for mariculture. Aquaculture, 1997, 151(1/2/3/4): 315-331. Whyte JNC. Biochemical composition and energy content of six species of phytoplankton used in mariculture of bivalves. Aquaculture, 1987, 60(3/4): 231-241. Fichez R. Composition and fate of organic-matter in submarine cave sediments-implications for the biogeochemical cycle of organic-carbon. Oceanologica Acta, 1991, 14(4): 369-377. Tselepides A, Polychronaki T, Marrale D et al. Organic matter composition of the continental shelf and bathyal sediments of the Cretan Sea(NE Mediterranean). Progress in Oceanography, 2000, 46(2/3/4): 311-344. Tung JWT, Tanner PA. Instrumental determination of organic carbon in marine sediments. Marine Chemistry, 2003, 80(2/3): 161-170. King P, Kennedy H, Newton PP et al. Analysis of total and organic carbon and total nitrogen in settling oceanic particles and a marine sediment:an interlaboratory comparison. Marine Chemistry, 1998, 60(3/4): 203-216. Lowry OH, Rosebrough NJ, Farr AL et al. Protein measurement with the Folin phenol reagent. Journal of Biological Chemistry, 1951, 193(1): 265-275. Marsh JB, Weinstein DB. Simple charring method for determination of lipids. Journal of Lipid Research, 1966, 7(4): 574-576. 庞晓宇, 吴静汇. 夏季巢湖叶绿素a的时空分布特征研究. 环境科技, 2013, 26(6): 1-4. 潘成荣, 汪家权, 郑志侠等. 巢湖沉积物中氮与磷赋存形态研究. 生态与农村环境学报, 2007, 23(1): 43-47. 王娜, 徐德琳, 郭璇等. 太湖沉积物微生物生物量及其与碳、氮、磷的相关性. 应用生态学报, 2012, 23(7): 1921-1926. 李青芹, 霍守亮, 昝逢宇等. 我国湖泊沉积物营养盐和粒度分布及其关系研究. 农业环境科学学报, 2010, 29(12): 2390-2397. 王小雷, 杨浩, 顾祝军等. 抚仙湖沉积物中营养盐和粒度垂向分布及相关性研究. 环境工程技术学报, 2014, 4(5): 353-360. 姜霞, 王书航, 钟立香等. 巢湖藻类生物量季节性变化特征. 环境科学, 2010, 31(9): 2056-2062. 孔繁翔, 高光. 大型浅水富营养化湖泊中蓝藻水华形成机理的思考. 生态学报, 2005, 25(3): 589-595. Rabouille S, Salencon MJ. Functional analysis of Microcystis vertical migration:a dynamic model as a prospecting tool. Ⅱ. 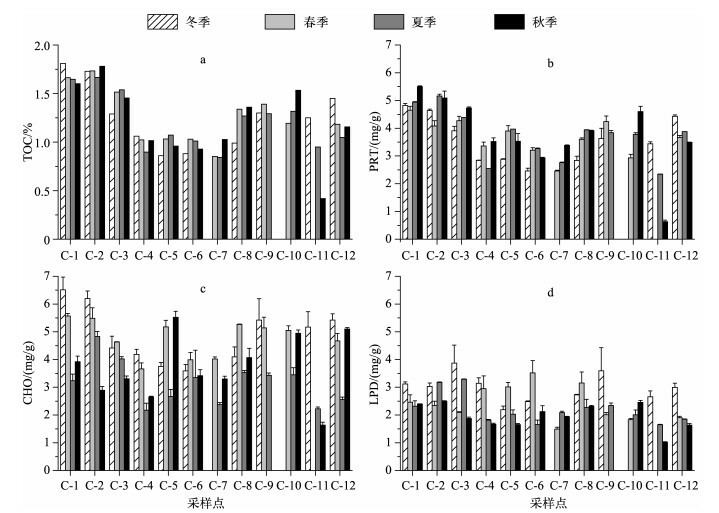 Influence of mixing, thermal stratification and colony diameter on biomass production. Aquatic Microbial Ecology, 2005, 39(3): 281-292. Gómez-Erache M, Vizziano D, Muniz P et al. The health of the Río de la plata system:Northern Coast, Uruguay. In:Chopin T, Wells PG eds. Opportunity and challenges for protecting, restoring and enhancing coastal habitats in the Bay of Fundy. Proceedings of the Fourth Bay of Fundy Science Workshops, Saint John, New Brunswick. Environment Canada, Atlantic Region. Occasional Report N° 17. Environment Canada, Darmouth, Nova Scotia, 2001. 刘菲菲. 巢湖藻源性有机物释放特征及控制[学位论文]. 南京: 中国科学院南京地理与湖泊研究所, 2014. Pusceddu A, Gambi C, Zeppilli D et al. Organic matter composition, metazoan meiofauna and nematode biodiversity in Mediterranean deep-sea sediments. Deep Sea Research Part Ⅱ:Topical Studies in Oceanography, 2009, 56(11/12): 755-762. 郑金秀, 彭祺, 张甲耀等. 藻类产生及清除过氧化氢的研究. 微生物学杂志, 2006, 26(6): 80-84. 李键, 陈敬安. 湖泊沉积物硅藻提纯方法. 地球与环境, 2007, 35(1): 91-96. 刘娟, 段昌兵, 唐红渠等. 沉积物硅藻提纯方法的优化. 生态科学, 2013, 32(6): 763-768. 黄维. 一种新型蓝藻清除机械的除藻机理及除藻试验研究[学位论文]. 长沙: 湖南农业大学, 2009. 叶云, 刘文汇, 腾格尔等. 巢湖蓝藻腐殖化过程中形态与成份变化研究. 微体古生物学报, 2012, 29(2): 152-160.